Destination Science camp’s program, geared towards young kids ages 5-11, has expanded to Merrick and Commack this summer, bringing their Long Island locations to 13. Long Island, NY - June 14th, 2013 - Destination Science camp’s program, geared towards young kids ages 5-11 (plus an all-new Leaders in Training program for 2013 for kids 12-15), has expanded to Merrick and Commack this summer, bringing their Long Island locations to 13. About 1,000 kids are expected to attend this summer (up from 600 last year). The Destination Science program is designed to combine science learning with fun. Kids build roller coasters, design and name their own robots, and participate in a bridge-building “survival exercise.” Each one-week session focuses on a different aspect of science, and discounts are available for multiple weeks. The camp also has locations in California, Florida, Washington State, Texas, and Westchester, NY. 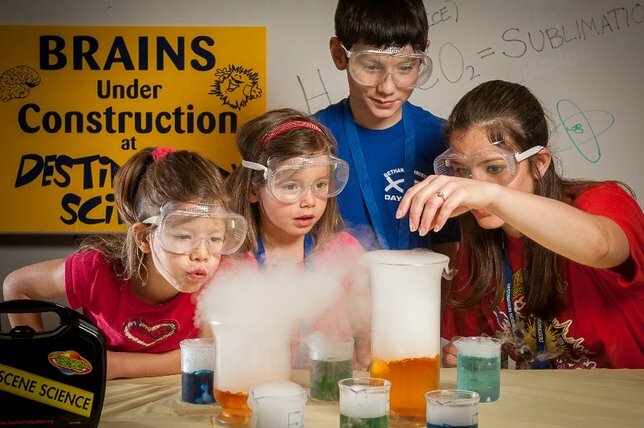 Destination Science teaches kids that science is not just about Bunsen burners and formulas. The summer camp is committed to creating a spirit of teamwork, as kids are rewarded for helping their peers throughout the day, learning the power of community, collaboration and character development. The Directors, Kathy Heraghty, Sharon Fogg and Heena Desai, each have extensive backgrounds in child education and a combined 50+ years of experience within science. They see the interactive and dynamic activities that Destination Science offers as a foundation for children to truly help change the world. The camp programs for summer 2013 are Crazy Coaster Science and Sea-Fari Park, Wacky Mega-Bot Tech, Astronaut Adventure Camp, and The Ultimate Survival Zone. For more information on Destination Science locations, dates, programs, or directors, please call (888) 909-2822 or visit www.destinationscience.org. Subject: LongIsland.com - Your Name sent you Article details of "Robots & Rockets Land Again in Long Island"